Aim/Background : Airway anomalies are infrequent but potentially life threatening in children. A program to care for these difficult children was set up at our institution, and this paper summarizes our experience. Methods: A total of 34 children were enrolled in the program over a period of three years. These children were evaluated as per the standard protocols. Treatment was individualized. Results: Of these 34 children, 28 had their airways restored and are doing well. Four children continue to remain on tracheostomy and two will require long term tracheostomy. There were two deaths. All children are under surveillance as there is a risk of recurrence. Conclusions: Airway anomalies are complex problems with significant morbidity and mortality. Current therapeutic modalities allow for good results. Most children were successfully decannulated and did well. 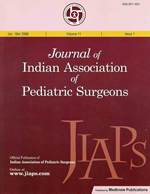 © Copyright 2009 Journal of Indian Association of Pediatric Surgeons.